DOES THE AMERICAN CULTURE REALLY SUPPORT WORKING MOMS? After decades of judging and shaming mothers for “abandoning” their kids while they went off to work to commit the horrible and selfish act of providing for their families, Americans are now overwhelmingly OK with working mothers, according to a paper published in the latest edition of Psychology of Women quarterly. One of the big objections to paid leave traditionally comes from businesses, which tend to argue that offering workers paid leave increases costs. But a mounting pile of evidence doesn’t support that theory. Nearly 90 percent of California businesses reported no cost increases due to the state’s now 10-year-old leave law, according to one survey. In fact, 43 percent of businesses in the state reported a cost savings, because they were able to hold on to more workers, (decreasing training costs), and reduce spending on benefits. Other companies, like Google, have also increased employee retention by increasing paid leave. Oh, and paid leave saves the government money and disproportionately helps lower-income women. In New Jersey, women who took paid leave were around 40 percent less likely to receive public benefits like food stamps or welfare, according to a Rutgers study cited by Claire Cain Miller in The New York Times. The statistics have been beaten into the ground. 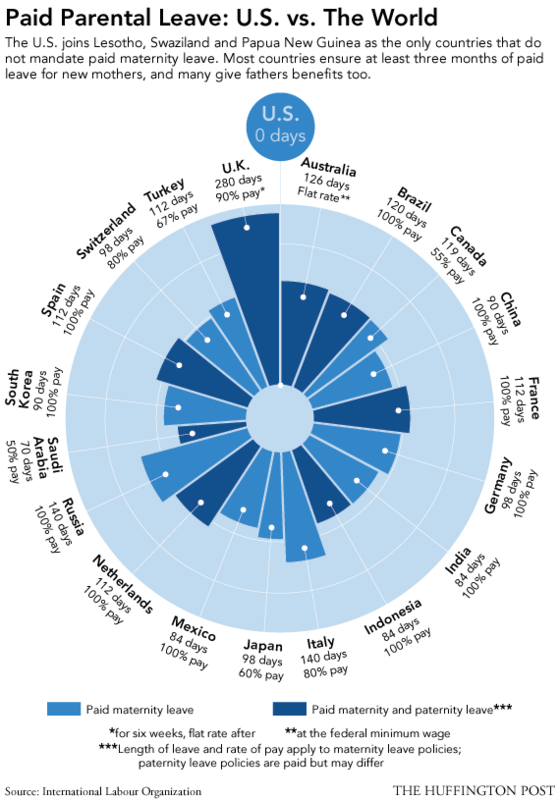 America offers ZERO days compared to the rest of the world and is on a level playing field with Lesotho, Swaziland and Papua New Guinea when it comes to not mandating paid maternity leave. The facts are staggering and actually, quite unbelievable. Women become defined in business by their pregnancy. Unable to change the minds of others, we are left with a minimal (required) UNPAID leave. Our far reaching goal should continue and persist in the change of these weak and insufficient policies for working families. We need to actively speak out and bring this topic to the forefront of peoples minds. It needs to be on the agenda for the upcoming presidential election. 1. Understand your rights. Is your company a small organization? Does FMLA apply to them? FMLA protects workers of organizations over 50 employees. What are the actual policies in your organization? Talk to your HR. 2. Does your company offer short-term disability? This is a great work around if no paid leave is offered. It will provide you with 6-8 weeks of partial paid leave. Do you need to sign up before you are pregnant? I am a lover of nature and everything Boston! As a career driven mama, I am always looking to find ways to balance motherhood with professionalism without losing touch with my fun side. A true believer in “keeping it real”, I spend my free time snowboarding, kayaking and love to run on the daily. I am a mother of a 4 year old (with another on the baby on the way!) and have been with my husband (also a lover of mountains) for 15 years. Professionally, I have been in the staffing industry for 12 years and currently serve as a Chief Operating Officer for an IT consulting firm, Relational IT. I uncovered my secret “geek” and passion for the sciences and information technology through helping people find new careers and have been instrumental in developing and cultivating business opportunities in the greater Boston area for my organization. I Co-Founded Blissfulmamas,a project created in order to shed some light on the positive aspects of being a working mama. Blissfulmamas is a networking community for working mamas with a positive outlook, looking to collaborate with each other on career advancements, job opportunities, managing and organizing family life, without forgetting about the long overdue personal “me” time. Our goal is to act as a positive outreach for working mamas and be a place where working mamas can collaborate, find resources & inspiration all available on the go! A New Step for Pregnant Women in the Work Place via WiLab! Sometimes when you become pregnant you feel a little nervous about how to break the news to your boss and coworkers. Imagine for a moment that you are in a job that requires you to be in the public eye. Now imagine that because of how you looked and dressed while pregnant, the public began heckling you. Sounds fake right? WRONG! After receiving numerous insults like this during her first pregnancy, she actually had to ask the public to be kind during her second. Anyone else completely appalled yet? Despite her admitted worry that by commenting on these ridiculous letters she was providing satisfaction to her haters, I believe it only further proved her confidence as a woman and a professional. She not only gave pregnant women a voice, but her coworkers backed her 100% in this venture. It’s very easy to be angry and feel that these types of occurrences are yet another setback for working mothers, but at Blissfulmamas, believe that this is a step forward! Kristi is an incredible model of strength and perseverance and the support she has received from coworkers and Global BC, proves that working mothers are taking another step forward! Blissfulmamas is inspired by living in the moment, embracing the chaos and enjoying the crazy wonderful ride of motherhood. As working professionals, we really do have it all! Come as you are and embrace it. Families are like snowflakes, each different and unique, no two the same. The antiquated idea of the perfect roadmap to raising a family, balancing a professional job, and everything else in and between is long overdue for a make over! Blissfulmamasis a networking community for working mamas with a positive outlook, looking to collaborate with each other on career advancements, job opportunities, managing and organizing family life, without forgetting about the long overdue personal “me” time. Our goal is to act as a positive outreach for working mamas and be a place where workingmamas can collaborate & find resources, all available on the go! New Posts on Boston Mom’s Blog! Check out our new posts on BMB! See the release of this story on WiLab! Just when you think you have a grip on your schedule, someone gets sick or the car breaks down. The only thing we can do in these moments is take a breath and keep moving forward. Lists for you, lists for hubby, lists for whomever. Get things off your plate, delegate. You can text or use an old fashioned notebook. Getting your ideas out of your head and onto a concrete piece of paper helps to clear your head and keep you organized. If you put in 100% effort, expect the same respect in return. When you are at work, keep focused and work hard. It’s easy to get distracted, but don’t let yourself. This attitude might help you move up in ladder. Set aside these hours for precious family time that your kids need. Turn off your devices until the kids go to sleep so you can relax and enjoy their company. Having a schedule too full of activities will push you over the edge. This includes work activities and your kid’s extracurricular ones. I am not saying to cancel every event, but be mindful of how much you are squeezing in to a small amount of time during the week and on your precious weekends. Everyone works hard during the week at work or school. The weekends should have some relaxation time built in so you can start the next work week fresh and stress free. My family tries to set aside one day with no obligations…Not even setting an alarm! 7. Breathe. Repeat. Breathe. Repeat.